What does ‘Out Of the System’ refer to? In this context as Dance Umbrella Guest Programmer curating ‘Out Of The System’, it refers to the multiplicity and overlapping of artists’ cultures along with the tools from vocational and non-vocational structures from global influences. ‘Out Of The System’ also means the rigorous navigation and crafting in and out of the conventional framing in how we present dance and performance works. In 2018 it’s still very rare to see ‘diverse’ billing platform under one roof of mid-career/established artists’ works at this junction. ‘Out Of The System’ is a metaphor…. Dance Umbrella ‘Out Of The System’ is an outright rhetorical provocation and motivation… to collaborate with… all sector members in the right frame of mind to action this…. • Dance Umbrella ‘Out Of The System’ 2017 in its inaugural curation /programming was a great way to introduce mid-career/established diverse local/global artists & their work/s in dance & live music – it was a festival within a festival. • The accessibility in the structure of seeing multiple works in different spaces under one roof of RichMix venue was exciting. • Enjoyment of the unexpected ownership and journey (feedback from spectators/audiences) of moving from one space to another within the same venue. And the anticipation of not know what’s next and in which setting. One half of the audience got a different journey to the other but they all came back together to share their experiences amongst themselves. This for me is very important for developing audience’s critical response and feeling comfortable to know your opinion is valid. The event ended with a live band set for all the audiences within a shared space to just simply enjoy the festivities. • The realistic cost of curating/producing this specific ambitious offer cannot be reflected in the charge for ticket/s and so we/I’m working to find more ways of subsidising the ticket price. • Just because an artist has been presented by/in one venue (establishment or off the radar), does not mean the work has been seen by everyone ‘in the know’ ie established programmers of mainstream venues and their audiences. Once again I feel DU ‘Out Of The System’ is laying a strong case for this discourse. Dance Umbrella ‘Out Of The System’ 2018 is much more straightforward compared to 2017 framing/structure in curation, i.e. we have one full length work ‘Via Kanana’ by Iconic choreographer Gregory Maqoma, one of Africa’s most successful companies Via Katlehong. 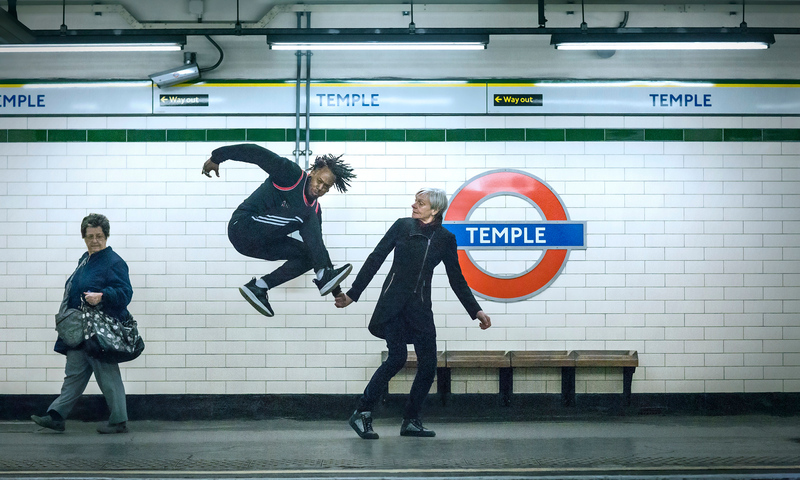 The other, CRXSSPLATFXRM is firmly rooted in the street culture of London but takes inspiration from far and wide, curated by choreographer/dance artist Ivan Blackstock. It also take on an exciting complexity in the cross-fertilization and implicit or explicit codes in movement language and conversation these two programmes have. The signature style of Via Kanana is Pantsula, a township dance, and this, combined with Gumboots (which originated with South African miners in the 50s) and Tap & Steps post, has and will continue to have invaluable influence in western diasporic street social & cultural practices. Playing in/out of western formulated structure of composition in black box expertly directed by Maqoma. Blackstock for CRXSSPLATFXRM will transform this same space into encapsulated experience/s of a ‘western’ township in main assemble Hall is Shoreditch Town Hall. For me this is perfect as Shoreditch has this feel, it’s just prices are inflated. This curation is a metaphor for feeling and seeing groove and craft of lineage within its own programmed night but also ‘out of the system’ representing ‘the whole is greater than the sum of its parts’ in this framing within Dance Umbrella. And that’s a great thing in us engaging with audience and supporting sector development and appreciation for the dance form/arts as a whole and once again its setting. There isn’t much to say at this stage as we are focused on making initial contact with artists and furthering the conversation with artists, but there are venues who we think can give and support the sensitivity of what you’re proposing. This collaboration with myself, artist/s and venue has to be fruitful beyond just presenting their work in a place/space. The values have to be innate principle in homing diverse/curious work…. 2019 edition of DU ‘Out Of The System’ will draw on the 2017 & 2018 framing of mixed billing of contrasting length of works. I see the curation and programming of 5mins – 30mins max length of work/s, to full length works (new & even more than 5/10 year old) in multiple venue/spaces that are within close distance to one another…. • Artists attending Lab, which is an array of Talks/Shows/Performances in and out of DU Festival and networking for Artists & Partners to start further conversations…..
•Time/Space to nourish, play, practise, reflect- an invaluable tool to the sector for local/global artists to check-in, to keep us doing what ‘WE’ do – best! • Residencies and international exchange to delve further into concepts & ideas for projects to be developed in/out of DU ‘Out Of The System’ and ‘SystemsLAB’ Tour. Bernie Grant Arts Centre, Dance Umbrella, East London Dance, One Dance UK, Pavilion Dance South West, Serendipity – Leicester, Studio Wayne McGregor, University Of East London, IRIE! Dance Theatre, NewVic. Bernie Grant Arts Centre, British Council, COMUNE DI BASSANO DEL GRAPPA – Operaestate Festival/ Bmotion programme (Italy), Dance Umbrella, One Dance UK, Pavilion Dance South West, Serendipity – Leicester, Studio Wayne McGregor, University Of East London, IRIE! Dance Theatre, NewVic.